Notes: A 30-minute Western that ran on ABC for 39 episodes from October 1958 to July 1959, this was Ted's screen debut followed quickly by several other guest appearances on other television Westerns. It was the story of two Union and one Confederate soldier who team up after the war to head west. Notes: Ted plays "Collie Smith" in this second season episode that was HC creator David Dortort's debut as a producer. Dortort also wrote the screenplay for the pilot of this 30-minute Western that ran on NBC for 78 episodes from March 1957 to June 1959. It was the story of Vint Bonner, a legendary fast gun whose reputation won't let him give up the business. Notes: Ted played "Nestor" in this episode of NBC's 30-minute Western about a Montana boarding house that ran for only 39 episodes during the 1958-59 season. HC guest, Frank de Kova, has a guest star role in this episode. Ted as Patterson swears Paladin in. Notes: Ted plays "Patterson", one of several rather dim-witted miners in this episode of Have Gun Will Travel, a popular 30-minute Western that ran on CBS from 1957 to 1963. Richard Boone starred as "Paladin", a dapper gunslinger who only used his gun as a last resort. Jerry Summers, Alex Sharp, Red Morgan, and Charles Horvath were some of the HC stuntmen who had contributions over the course of the series. The full series is now available on DVD in excellent black & white quality. Notes: Ted played "Early Schuler" in this episode of another short-lived 30-minute Western. 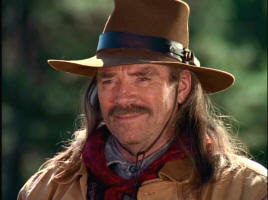 It ran for 37 episodes on ABC, about an insurance investigator who traveled the West in the 1880's. Notes: In this, his second appearance on Have Gun Will Travel, Ted has a significant role as "Shorty", with two long conversational scenes. HC guest, Charles Aidman, is the guest star here. Notes: Ted played "Bill Towley" in this episode of the short-lived 30-minute NBC Western about a one-armed gunslinger that ran for only 13 episodes. Notes: Ted played "Cass" in this episode of Outlaws an edgy NBC Western played from the outlaw point-of-view that ran for two seasons in Thursday evening prime-time. 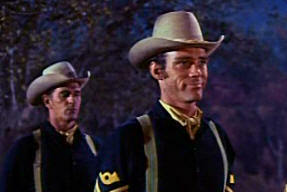 Don Collier played Deputy Marshal, "Will Foreman", in what was his break-out film role. HC producer, Kent McCray, was Associate Producer for the series. Notes: Ted played "Jack Talbot" in this first season episode of the popular CBS Western-Spy series that ran from 1965-1969. It used a 60-minute format that began as black & white but switched to color in 1966. Ted Markland as "The Bandleader"
Ted directing his army band. Notes: After appearing for eight years in a variety of television guest roles, Ted made his debut on the big screen in Hallelujah Trail. 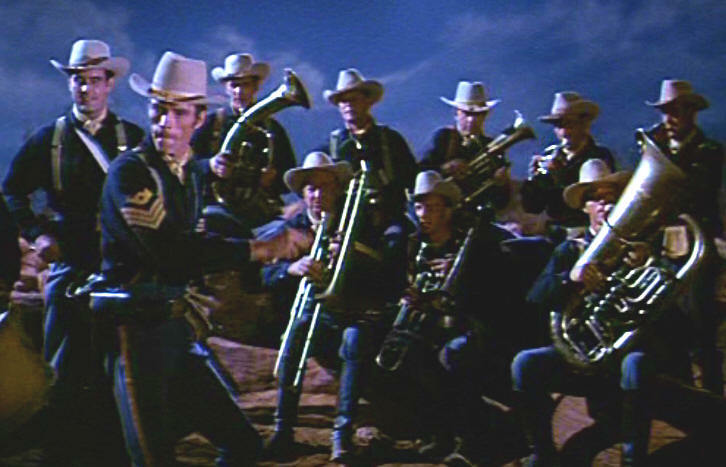 He plays the cavalry band leader commandeered by the local ladies temperance group to play marches for them. The movie has a lot of major star presence and some beautiful cinematography but it is a bit long for a film that is working hard to be a comedy/satire. Lots of horse and wagon stunt work here along with some tongue-in-cheek pokes at the Western genre. Other HC Actors include: Dub Taylor, Helen Kleeb, Jerry Gatlin, John McKee, Carl Pitti, John Dehner, and Eddie Little Sky. HC Stunt Contributions: Steven Burnett, Tony Epper, Jerry Gatlin, John McKee, and Carl Pitti. Notes: Ted plays "Boone" in this episode of David Dortort's sister series, Bonanza. It ran on NBC from 1959-73. 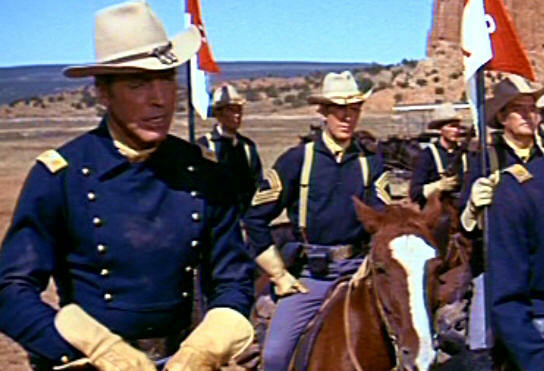 Nearly everyone involved with HC is credited with contributions to Bonanza as well. This episode included Don Collier in a guest star role as well as HC guests, Charles Maxwell and Troy Melton. HC stuntmen who also worked on Bonanza during its run included Henry Wills, Bob Hoy, Jerry Summers, Jerry Gatlin, Bob Herron, Whitey Hughes, Troy Melton, Alex Sharp, Neil Summers, Bob Terhune, Jack Williams, Jay Jones, and Carl Pitti. Notes: Ted has a role as "Soldier #2 in this comedy Western film, which is not quite politically correct in its attitudes towards women. It is irreverent but fun if you can set aside the insensitivities of its production era. Includes a stellar cast. HC associated actors appearing here include Bruce Dern, Roy Jenson, Robert Cornthwaite, and Buzz Henry. 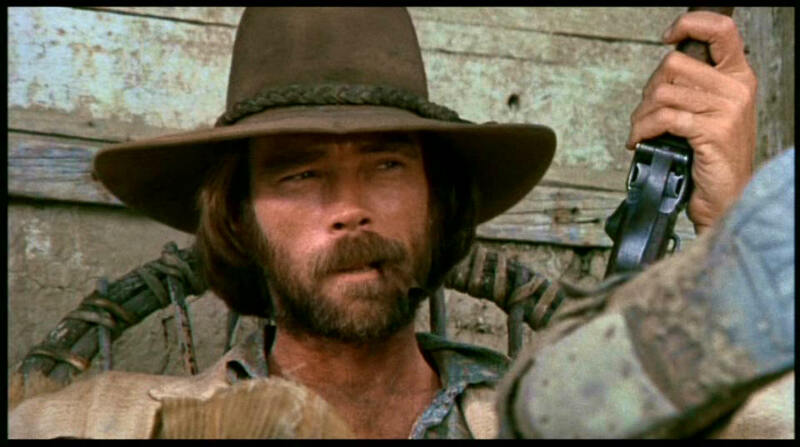 Notes: Ted plays a minor villain, "Luke", in this wistful independent film in the vagabond tradition of Easy Rider. This was Peter Fonda's directorial debut. Very fine cinematography and effects with lots of attention to set and scenery detail along with a haunting soundtrack. One of the first Westerns of the era where pioneer women don't wear false eyelashes and heavy make-up. A fine sleeper if you haven't seen it yet. Notes: Ted plays one of the troopers in this cult classic that continues to win rave reviews as an early realistic Western, sometimes referred to as a Viet Nam allegory. Joaquin Martinez, who guested in four HC episodes plays the title role here as Ulzana. Other HC personnel with acting credits include: John McKee, Tony Epper, Fred Brookfield, Jerry Gatlin, and Richard Farnsworth. HC stunt contributions from Fred Brookfield, Chuck Courtney, Patty Elder, Tony Epper, and John McKee. Notes: Ted plays "Corporal Hap Evans" in this story of an orphaned boy learning to make his way in the West. HC guest, Todd Martin also appears here. Notes: Ted plays "Horton" in this New Mexico Western about an Indian who is half white who attacks a gang of outlaws. Notes: Ted plays "Nugget" in the first two parts of this star-studded 10-part mini-series about a the Macahan family's emigration west. 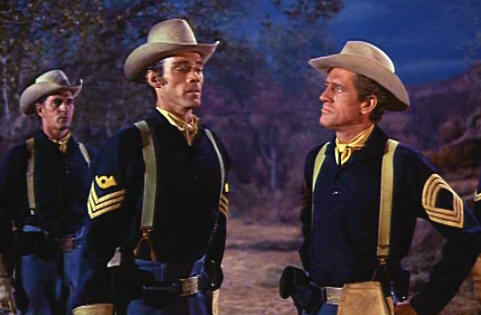 HC cast members, Cameron Mitchell and Don Collier also have roles, along with a host of other HC actors includeing James Almanzar, Robert Donner, Robert DoQui, Bert Freed, Warren J. Kemmerling, Eddie Little Sky, Sean McClory, Ricardo Montalban, Gregg Palmer, John Pickard, Dub Taylor, Mills Watson, Morgan Woodward, William Conrad, Robert Phillips, Ted Jordan, and Larry D. Mann. Neil Summers worked on the stunt crew. 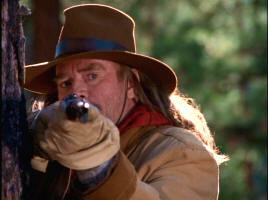 1994 The Adventures of Brisco County Jr.
Notes: Ted has a minor role as "Duster #1" in this futuristic Western series with similarities to The Wild, Wild, West. It ran on the Fox Network for just 26 60-minute episodes during the 1993-94 season. Notes: Ted plays a significant role here as "Colonel Howling", a Colorado rancher turned gold prospector in this independently made Western set in 1879. Great Colorado scenery, authentic costuming and excellent cinematography. 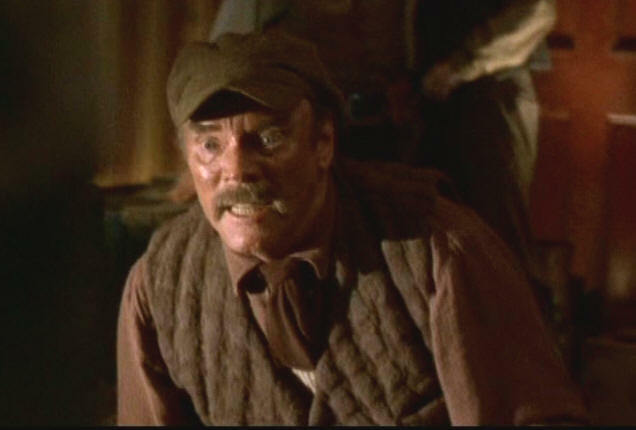 Notes: Ted plays "Tommy Drum", the saloon owner who comes to Wild Bill's rescue when he is set upon by a gang of thugs. Unfortunately he is mostly shot from behind or in low light and fast motion. 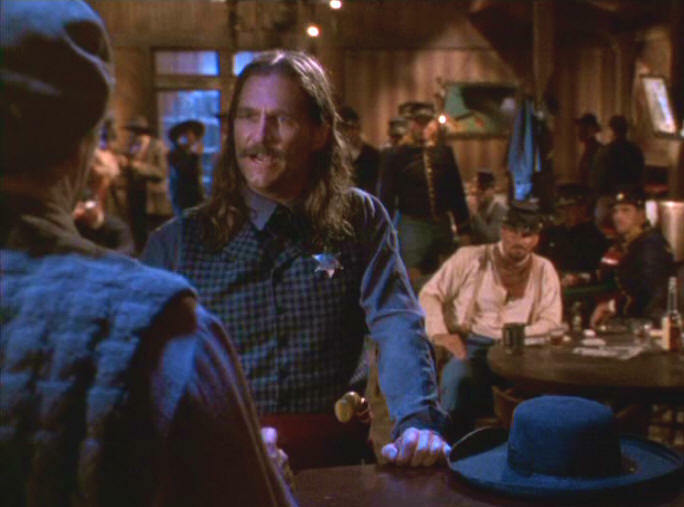 This stylistic portrayal of the life of Wild Bill Hickock shows the rough edges of Deadwood and a man caught by his own reputation. HC actors James Gammon and Bruce Dern also have roles here. Notes: Ted plays "Cole" in this 1995 revision of life on the Ponderosa. 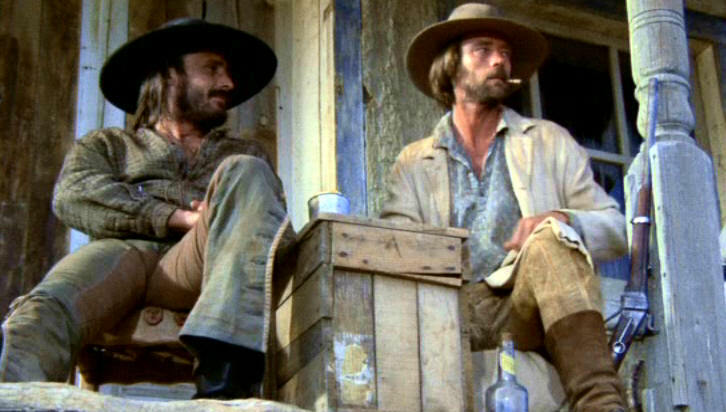 Other HC actors who had parts here include HC cast member, Don Collier, and HC guest, Jack Elam.